Under the guise of “eliminating stigma” and eradicating “terminology [that] enforces a dualism between psychiatric and medical conditions” the American Psychiatric Association appears hell bent on colonising the entire medical field by licensing the application of a mental health diagnosis to all medical diseases and disorders. The third DSM-5 Development public review of proposals for revisions to DSM-IV categories and criteria runs through May 2 – June 15. This will be the last opportunity for stakeholders to submit feedback. Register on the DSM-5 Development site to submit comment or use your previous user name and log in details if you submitted during the earlier reviews. For information on registration see this post from 2011. One again, I’m collating copies of submissions to the Somatic Symptom Disorders Work Group on a dedicated page from international patient organizations, medical, allied health and other professional stakeholders, patients, advocates and professional bodies. Any consumer groups, medical professionals, allied health professionals, social workers, lawyers etc with concerns for the Somatic Symptom Disorders proposals are welcome to forward copies of submissions for publication here. Misdiagnosis is a common occurrence by all accounts. Therefore medical definitions or criteria should not only assist diagnosis – they should positively aim to prevent or reduce misdiagnosis. 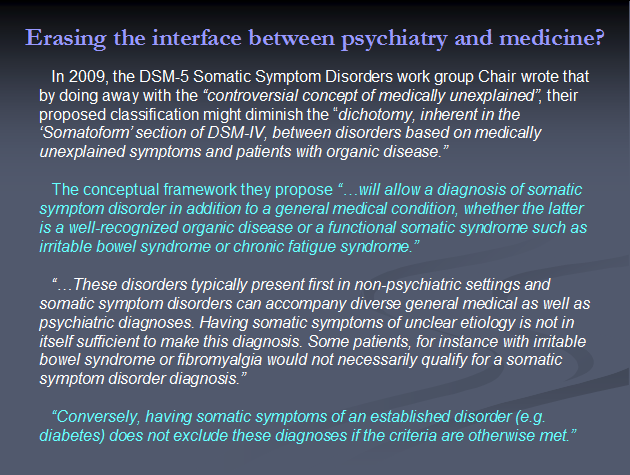 Somatic Symptom Disorder (SSD) as proposed for DSM-5 allows too many possibilities for misdiagnosis. Misdiagnosis that could have disastrous consequences. This is so readily foreseeable that this must be addressed. Once a physician diagnoses SSD, they have effectively judged the patient incompetent to interpret their own symptoms. If the patient has an unrecognised disease that progresses, or develops a new disease and reports the new symptoms to the doctor, what will the doctor do? The patient is untrustworthy. The doctor is busy and has ‘real’ patients to treat. It is inevitable that even patients that are correctly diagnosed with SSD will sooner or later present with actual physical disease. The diagnosis of SSD could predictably obstruct investigation and treatment of their disease. This obstruction could be directly attributed to the use of an SSD diagnosis. SSD should not be included in DSM-5 unless specific guidance to prevent misdiagnosis are included and these have been proven effective. Imagine a doctor with a patient presenting in the early stages of MS. MS can be difficult to diagnose. When Professor Poser reviewed 366 MS diagnoses made by board certified neurologists, he found that only 65% had been correctly diagnosed (http://www.cfids.org/archives/2000rr/2000-rr4-article03.asp ). It can take years before the signs, symptoms and tests are clear enough to make a diagnosis (http://ms.about.com/popular.htm ). The symptoms of ‘pre-diagnosis’ MS can be very distressing and the lack of a laboratory test or firm diagnosis may add to a patient’s worries. The patient may try all sorts of strategies to try and find out about, and improve what is happening to them. They may appear to pester their GP, they may appear neurotic and irrational. Now imagine that in accordance with DSM-5, a doctor gives them a diagnosis of the proposed SSD. The patient has an official diagnosis in their medical records that amounts to ‘hypochondriac’. What effect will that have on the patient’s chances of getting the necessary investigations as the disease progresses? How is it going to help them to cope with their distressing physical symptoms now they have been explained as psychosomatic? The time it will take for them to get a true diagnosis may be further prolonged, and the years spent waiting could be made even more harrowing because of inaccurate psychological labelling. Therefore sensible doctors will avoid diagnosing SSD. Foolish doctors risk spending their time at professional disciplinary hearings and in court; and this still might not adequately reflect the amount of suffering their diagnosis of SSD could cause. I believe it safe to say that ‘positive symptoms’ does not mean ‘good symptoms’ or ‘symptoms with the right attitude’. I imagine it means definite, definable, testable and maybe even measurable. But when terms like ‘distressing’ and ‘excessive’ are used to measure symptoms, the definition is not a definition. It is not even a convincing concept. 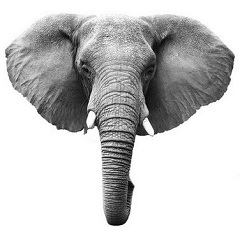 The idea is right, to base the definition on signs and symptoms that are actually present, as long as these sufficiently differentiate the condition from other conditions and do not lead to too many misdiagnoses. Unfortunately, they would predictably fail to achieve this because the definition proposed is significantly subjective. The ‘DSM-5 Proposed Revision’ could certainly misdiagnose M.E. This would be a serious matter as M.E. is classified by the WHO ICD as a neurological illness. A doctor whose diagnosis of SSD was contradicted by a doctor that diagnosed M.E could find themselves in an awkward legal situation. The implications to the proper care of a patient, due to misdiagnosing a serious neurological illness as a neurotic illness hardly bear thinking about. Hindering necessary investigations and treatment might only be a small part of the problems this might create. Therefore every patient with M.E. or CFS or ME/CFS will present with ample distressing and disruptive symptoms to satisfy DSM-5 Somatic Symptom Disorder Part A. “B. Excessive thoughts, feelings, and behaviors related to these somatic symptoms or associated health concerns: At least one of the following must be present. Therefore even the mildest form of CFS sees persons who have often greatly reduced or stopped socializing, hobbies, sports etc. ; and spend much of the time formerly devoted to these pursuits in resting and recuperating their energy to continue working. When this level of disruptive illness goes on for more than 6 months, people will naturally and rationally become worried. They will be fearful of what is happening and what is going to happen. They will be anxious about their responsibilities, their job, their family and friend connections – everything. They may quite naturally seek help from their GP. They may be given antidepressants, sleeping medications, pain killers, etc. All these combined with a chronic illness necessitate frequent visits to their GP. They may try alternative therapies (possibly after having found what their GP offered did not help them). They may alter their diet, take nutritional supplements, go for acupuncture, homeopathy or other type of therapy. And here is the rub; if one does not believe they are actually physically ill, their ‘thoughts, feelings and behaviours’ will certainly appear ‘excessive’. This could apply not just to CFS, but many other high impact and distressing illnesses. The proposed definition does not address this problem. It might actually make it worse. If doctors believe that SSD has a valid definition they may start actually using it – then God help us. If a person with just ‘mild’ CFS is justified in being worried, justified in resting so they can keep working, justified in searching for something that will improve their health – then anyone with the illnesses mentioned could meet the criteria to satisfy DSM-5 Somatic Symptom Disorder Part B. The same ‘Rationale’ for SSD remarks on: “The lack of positive psychological features in the definition”. Unfortunately the proposed criteria attempt to define “positive psychological features” based entirely upon a physician’s subjectivity. That is not, in any sense, a definition. This is why I believe the circular-reasoning trap constructed with SSD makes it risible. They construct a concept for SSD. They construct criteria for the concept. Chicken-egg or egg-chicken, take your pick. The problem with this approach is that it does not IDENTIFY the psychological condition they are trying to define. SSD cannot exist only by differentiating features, this is true. Yet differentiating is an essential step. SSD must discern from other anxiety or depressive disorders. It must be discern from normal or rational anxiety, whether that anxiety is acute, chronic or fluctuating. It must discern from anxiety or depressive disorders due to neurological illness or injury. It must discern from physical illness that has not yet been diagnosed, or from physical illness for which diagnosis is complex or often delayed. It must discern from new or emerging diseases. If SSD cannot discern from these, then misdiagnosis could be a common and predictable result. The criteria should define the disorder but they don’t. They attempt to define the criteria. The disorder should inform the criteria, but it doesn’t. The disorder is lost in a confusion of subjective terms, ‘excessive’, ‘persistantly’, ‘disproportionate’, ‘seriousness’. The only way it can work is if someone (and here’s another trap); someone who believes that SSD exists and is defined by the DSM, decides what ‘excessive’ and ‘disproportionate’ etc., mean. Then all they have to do, is reach exactly the same conclusion that every other physician using the DSM would reach in the same position. Bingo. A diagnosis that does not mean anything other than what the ‘diagnoser’ decides that it means. And they better hope they got it right, otherwise a good lawyer will wipe the floor with them. Mild CFS will satisfy DSM-5 Somatic Symptom Disorder Part C. Therefore every person with M.E. or CFS could get a diagnosis of SSD unless they can convince any psychiatrist they encounter that they are not ‘excessive’, ‘persistent’, ‘disproportionate’, or that they don’t believe they are seriously ill.
A serious anomaly might arise with SSD in both M.E. and CFS. These illnesses can start with only fatigue or just a few symptoms. Extreme fatigue and pain might be all that a patient reports. However, if the illness continues over years, some symptoms may improve whilst new ones appear. Problems such as sensory impairments, bladder and bowel problems, immune dysfunction, and a host of neurological symptoms (to name but a few) can develop. Will the M.E. or CFS patient then be vulnerable to having their previous diagnosis ‘cancelled-out’ by a new diagnosis of SSD, because they developed too many symptoms and are worried about them? The SSD development group have repeated previous flaws they identified as creating the need for new definitions. They have not defined anything. Yet there may be some positive outcome from their efforts. I imagine that some medical insurance company executives must be rubbing their hands together in glee, but medical negligence lawyers should be turning cartwheels. *Editor: Accompanying the first and second release of draft proposals for the Somatic Symptom Disorders categories, two quite lengthy PDF documents that expanded on the disorder descriptions and validity/rationales were published in conjunction with the webpage Proposed Revision, Rationale and Severity texts. and financial problems. This type of negligence and betrayal by the medical community has to be stopped. This syndrome is disabling enough for some without further suffering caused by medical professionals ignorant of the symptoms caused by severe CFS/ME. I would like to seek litigation in relation to this but am unsure how to go about it. I have no quality of life thanks to this Dr that met with me for one hour and would not even let me speak. If you have CFS be very careful who you seek care from esoeciallly those in psychiatry.